Gastric electrical stimulation represents a new paradigm for treating obesity and diabetes, since its mechanism of action is physiological rather than anatomical modification of the stomach. The following describes a feasibility study of an investigational device, the TANTALUSTM System, intended for use in obese and overweight subjects with type 2 diabetes. The TANTALUSTM System (Metacure (USA) Inc.) uses automatic detection of food intake and delivers electrical pulses synchronized to intrinsic gastric electrical activity. This multi-center study is conducted with an FDA/IRB approved IDE. The study design includes 16 obese/morbidly obese subjects, with a BMI between 30 and 45 kg/m2 and HbA1c of ¡Ý 7.5% and ¡Ü 9.5 %. The TANTALUS System is laparoscopically implanted, and therapy is initiated five weeks post-surgery. Subjects undergo 12 weeks of treatment, with periodic evaluations of HbA1c, fasting blood glucose, weight, serum adiponectin and ghrelin measurement. The patients will be monitored for safety and functionality of the device for an additional 18 months. To date, 14 subjects have been implanted with automatic eating detection successfully demonstrated (BMI 38.7¡À1 kg/m2, HbA1c 8.5¡À0.2 %, Mean¡ÀSdev). Data representing measures of safety and functionality will be presented consisting of adverse events, measures of glycemic control, changes in weight and the hormones ghrelin, adiponectin and GLP-1. 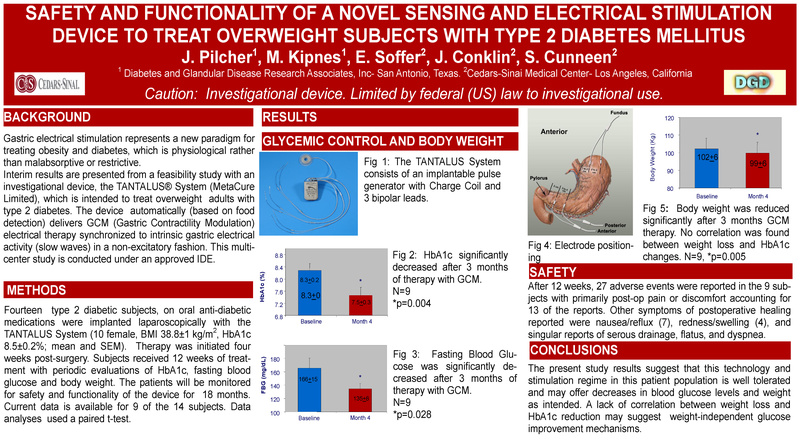 Follow-up of all implanted subjects into this multicenter feasibility study of an investigational gastric sensing and electrical stimulation device to treat obese or over-weight subjects with T2DM is on-going. Preliminary safety and functionality data will be presented from all study subjects.